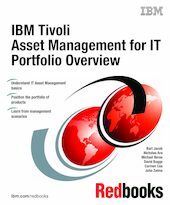 This IBM Redbooks publication provides an overview of the IBM Tivoli Asset Management for IT portfolio. The portfolio is made up of the three primary products, IBM Tivoli Asset Management for IT, IBM Tivoli License Compliance Manager for z/OS, and IBM Tivoli License Compliance Manager. By using these products together, you can implement a comprehensive IT asset management solution. This book provides a functional overview of each of the products in the portfolio and also provides example scenarios of how they can be used to address IT asset management disciplines. The IBM Tivoli Asset Management for IT product is a relatively new acquisition. It has its roots in enterprise asset management and has very rich function. This product will be enhanced and adapted to provide functions specific to IT asset management, such as facilities to handle contract management, full asset life-cycle management, integration with Enterprise Resource Planning (ERP) solutions and much more. This book introduces the portfolio and describes its current capabilities. Our intention for the future is to provide additional materials for a deeper understanding of best practices for using the portfolio to implement a complete IT asset management solution.